“In wine is truth”, said the ancients. It is true that alcohol in limited quantities helps loosen one’s inhibitions but in Japan it is often used as a social lubricant in a society that still sees a necessary gap between one’s real feelings and intention (honne) and what one says on social occasions (tatemae). Drinking with classmates or team mates when you are a student, or with colleagues when you are an employee is an important activity if you want to be part of the group. 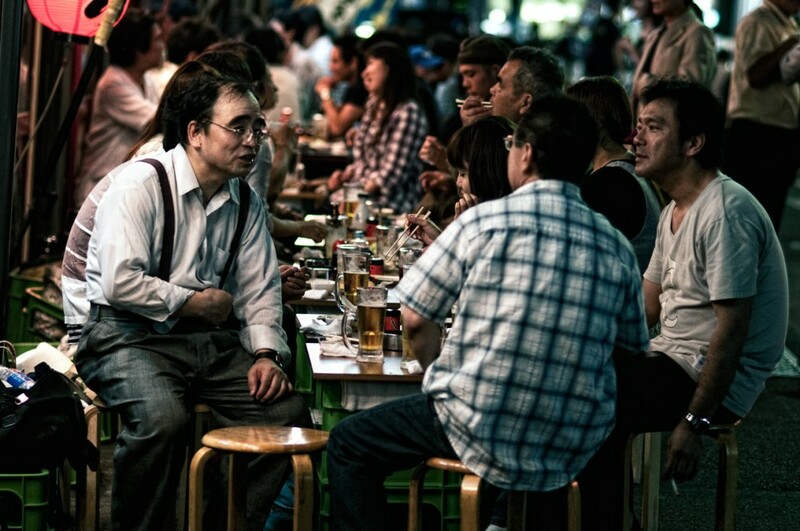 According to many, it is with a glass of beer or sake in hand that a new type of franker communication may occur, or a nommunication. Nommunication (roughly translated as drinkommunication) is a term created by mixing the verb nomu (to drink) and the term ‘communication’. It can be defined as an important part of becoming a social person [en], as it deals with the working etiquette of an employee, and was created to indicate the type of communication that is established between a superior with his junior colleagues over social drinks apart from the office. Alcohol is, in some cases, a businessman’s best friend as it is over a glass of shochu [en] that the best negotiations happen. As with many other cultures, inviting clients to dinner is a common habit in the Japanese working culture, and the so called settai, often translated as ‘business entertainment’, is as important as the meetings that the company executives may have with their clients in the company offices. If nommunication is a powerful tool in the hands of a salesman, it is sometimes the cause of pressure and stress for those junior employees who feel obliged to accept their superiors’ invitation. Male employees are more exposed to this kind of pressure as they are expected to be heavy drinkers. A recent discussion on Twitter [ja] brought to light this deep-rooted stereotype as Twitter user@shisetsu commented that he finds it unpleasant that it is taken for granted that everybody must drink alcohol. @shisetsu’s few tweets sparked a debate on the habit of after-hours partying where colleagues often gather to drink alcohol at an izakaya as a way to relief stress but sometimes to foster the relations among the team. While some other Twitter users agreed with him saying that sometimes they feel they obliged to drink as every one else does, @akcanon responded saying that drinking alcohol is part of a social duty for an adult. @shisetu I think that if you don’t drink, you must not simply say so but you must explain the reasons thoroughly. You are not a student anymore but an adult and being able to communicate is important in the working place. You are not getting paid only to do your work and that’s it. The swift reply by @shisetsu [ja] changed the tone of the conversation and later on made @akcanon apologize and reflect over the idea that being a working person is equal to being an alcohol drinker. @akcanon I don’t have any health reasons as to why I can’t drink alcohol but my dad was an alcoholic and this resulted in domestic violence to my brother and I when we were children. So as a reaction to this, I don’t drink at all. Explaining all this at a dinner and making the mood strained … would this be the kind of atmosphere and communication that those who drink wish? There is no cause and effect relationship between valuing other people and drinking alcohol. Working environments have been changing in the last years, mainly because of the economic crisis and the system is collapsing. Some believe also that some social obligations like nomunication are becoming less pressing and fewer and fewer younger businessmen feel it as duty to step their career up. Probably to avoid the social pressure that drinking with acquaintances may cause, more and more people have also been choosing to have their drinking parties online in convenient virtual meeting places provided by major brewers, or in drinking chat sessions. Possible side benefits include no need for make up for the women and probably no heavy drinking for the men. Italian living in Tokyo, between March 2009 and September 2011 I was the Japanese language co-editor for Global Voices with Tomomi Sasaki.